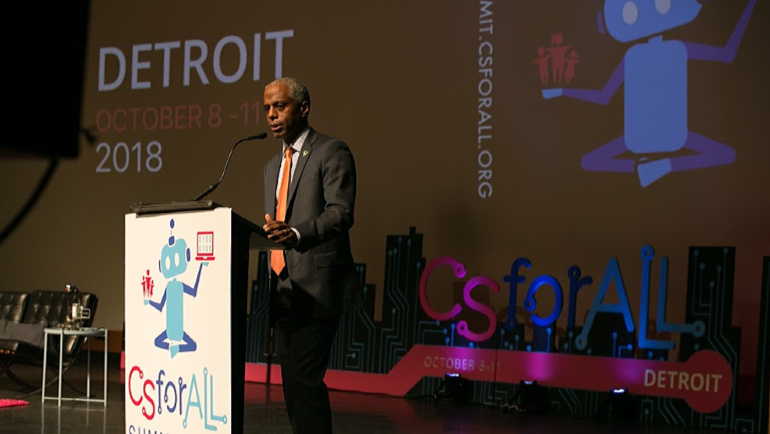 From Oct. 8-11, Wayne State hosted the second annual CSforAll Summit — a national event dedicated to expanding computer science courses for all students — and welcomed more than 400 attendees, plus thousands of online participants across the country, to campus. Attendees participated in workshops, learned from best practices, and received insight and knowledge about what other organizations are doing. Wayne State was one of more than 300 organizations that announced commitments to the CSforALL movement, which focuses on accessibility to computer science education. During the summit, Hubbard announced that Wayne State — as part of a campus-wide commitment to computer science education — would award college credit to students who pass the AP Computer Science Principles Exam with a score of four or higher beginning this academic year. C&IT will also host four high school interns during summer 2019 as part of Grow Detroit’s Young Talent, Hubbard said, and currently hosts IT internships to 10 WSU students to further their understanding of computer science, infrastructure and organizational integration. Additionally, Wayne State’s DHacks will offer weekly workshops throughout 2019 focusing on artificial intelligence, user experience and web development for Detroit students age 11 and up. 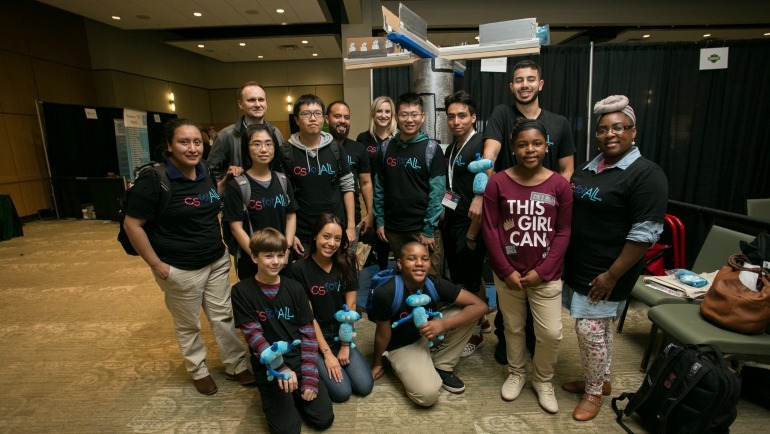 First organized in 2016 as part of former President Barack Obama’s science education initiative, CSforALL is the national hub for the Computer Science for All movement that works to enable all students in grades K-12 to achieve computer science literacy as an integral part of their educational experience. CSforALL sets a collective agenda together with a membership of more than 500 content providers, education associations, nonprofits, researchers and industry supporters to provide rigorous, inclusive and sustainable computer science education for all U.S. students. Commitments from all the organizations during the summit centered on addressing equity for underrepresented students, computer science accessibility for students with disabilities, cybersecurity education and evidence-based computer science education pathways. These new commitments will yield learning opportunities for 47 million K-12 students and 246,000 teachers across the nation in the form of education programs, after-school and summer programs, research efforts, learning aids, accessibility tools and more. View the complete list of commitments. Wayne State was one of 14 universities to sign the CSforALL Accessibility Pledge to rally the national community of computer science education content creators, program providers, educational institutions, researchers and investors to take immediate steps to achieve accessibility for existing efforts, and ensure that future efforts address accessibility within the design phase. Wayne State also took center stage at the CSforALL Summit with the Twitter-activated vending machine. A group of Detroit youth from several K-12 schools, along with students from Wayne State and other universities, was aided by expert mentors who worked on a Twitter-operated vending machine as part of a hackathon. Via an interaction with Twitter, summit attendees input a code and received a stuffed robot (based on the CSforALL logo) from a 7-foot-tall, tree-shaped vending machine. Detroit youth from several K-12 schools were aided by expert mentors who worked on a Twitter-operated vending machine. With support from Wayne State University’s Office of Undergraduate Admissions, the College of Engineering, and community partners CodeKey and i3Detroit Makerspace, the team of students was brought together to design, code and build the Twitter-activated vending machine.